A dry and mainly cloudy night after a clear start to yesterday evening. Cloudy so far this morning, with intermittent light drizzle arriving in the last half hour. Cloudy with drizzle and light winds. 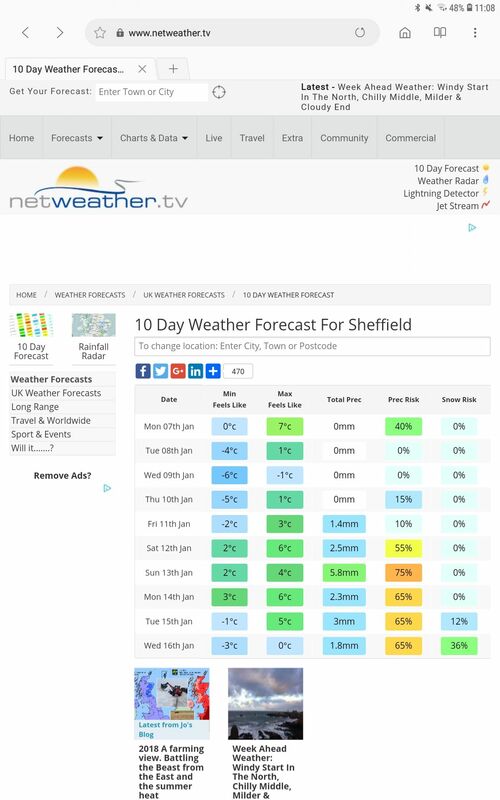 Ooh finally showing a snow risk on the Netweather 10 day. Only a small % but i'll take it! A windy start to the day with heavy showers around and some short-lived sunny spells in between the showers. Rainfall total so far today 2.1mm. Wind speed 32mph gusting to 45mph highest gust so far today 53mph. Maximum temperature to 18:00 GMT yesterday 9.2C. Another overcast night, no change this morning. Bright spells developing locally. Staying dull and cloudy in locations close by with drizzle and mist. Milder. A dull, mild day with a few spots of rain early afternoon. Becoming breezy as the day goes on. Maximum 10.8, minimum 7.9. Wind moderate W.
A very mild day.Cloudy light rain and drizzle in the afternoon bringing the first measurable rain of the month. snow early doors..clearing skies now... temps -14c windchill it feels like -22c . A cloudy day. The morning was dry apart from a little drizzle between 0845 and 0930 but the afternoon was quite wet with persistent light rain or moderate-heavy drizzle. The afternoon continued the sunny spells and during the evening had a few heavy showers. Still strong gusty winds up to 40mph. Wind speed 22mph gusting to 35mph highest gust today 53mph.